"This is one of mums recipe's that everyone just loves. It's versatile as you can add just about any vegetable. Perfect as an appetizer." Bring a large pot of lightly salted water to a boil. Add the cauliflower and cook until tender, 5 to 10 minutes; drain and break cauliflower into small pieces. Combine cauliflower, bacon, and green onions together in a bowl. Season with salt and pepper. Sift flour into a bowl. Whisk milk, egg, Parmesan cheese, and a pinch of salt into the flour until smooth. Add milk mixture to cauliflower mixture and stir until batter is evenly combined. Heat a lightly oiled griddle over medium-high heat. Drop batter by large spoonfuls onto the griddle and cook until golden brown on one side, 3 to 4 minutes. Flip and cook until browned on the other side, 2 to 3 minutes more. Repeat with remaining batter. 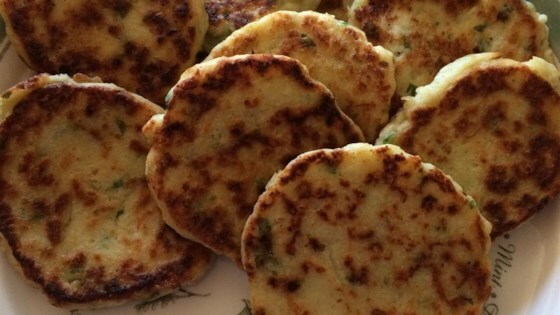 See how easy it is to turn cauliflower into delicious fritters. Great but I baked at 375 for 20 minutes then flipped for another 20 minutes. Served with a yogurt, lemon juice and dill sauce. Nothing could be easier. Very yummy!! Because I didn't have any milk, I used water instead, and they still turned out fine. They're potato pancakes with cauliflower instead, so good. I love these...so tasty..will make them again..